As we enter another winter here in the Northern hemisphere, questions about chest rubs, cough and cold syrups, salves and liniments for sore muscles and joints are increasing. Short days and long nights bring some of us a sense of dread with Seasonal Affective Disorder looming in the dark. Literally dripping with an abundance of healing plant chemicals, our tree saps, across the globe, have traditionally addressed these discomforts and many more. They are well established as antibacterial, anti-inflammatory, antitussive, and agents of emotional grounding and spiritual clarity. The anti-cancer and anti-arthritic properties of the Frankincense family are getting a lot of attention lately with the isolation and research of Boswellic acids. Mastic and other oleoresins are proven treatments for peptic ulcers. Myrrh essential oil and tincture are among the best healers for teeth and gums. Pine, Spruce and Fir saps share long histories of use around the world as decongestants, muscle relaxants and relievers of musculoskeletal pain. Most are used to heal and protect our skin, as they do for the trees that bear them. The list of therapeutic properties our trees bring us grows daily as more research is performed and ancient traditions are examined. Friars Balsam. A tincture of “exotic” tree saps. Popular since the Victorian age and available still in most drug stores. The past few decades, with the wonderful growth of Aromatherapy, we have focused on essential oils as representatives of the therapeutic powers of plants. However, in the case of oleoresins, the essential oils only bring us a small part of the healing compounds in the plant material. Distillation of fresh Spruce sap with pressure cooker pot-still and Allihn condenser. In oleo-resins, the essential oils are the volatile constituents that evaporate before, and up to the boiling point of water. When these flammable chemicals have evaporated, many of the tree’s valuable therapeutic compounds, the “heavier” constituents, are left behind in the resin. Hence oleo, or essential oil, and resin=oleo-resin. Solvent extractions such as Friars Balsam, (an alcohol tincture of Balsam Peru, Balsam Tolu and Benzoin), , can bring us a more Holistic” and whole product since they collect both the volatile essential oils and the “heavier” resins that remain after the distillation process. Using solvents provides us with a simple method for extracting many more of the valuable healing constituents from oleoresins, including much researched and talked about compounds such as Boswellic acids, Incensole and Incensole Acetate from Frankincense which recent studies have shown to possess anti-cancer and anti-anxiety properties respectively. These powerful healing compounds and many other constituents of our oleo-resins will not be found naturally in the distilled essential oils. are pretty straight-forward. The alcohol readily dissolves most resins and volatile oils, bringing us the whole sap in the form of a tincture. We know much less about the therapeutic properties of the gum present in many oleoresins, however, if you wish to include them, a water/alcohol solvent mixture will add these water-soluble gums to your medicine as well. For oral care, I have found nothing as effective as a mouthwash made from a tincture of Myrrh. This can be made easily at home with whole Myrrh oleoresin and pure alcohol or an alcohol-water mix such as Vodka. 3 parts 45% grain alcohol or unflavoured Vodka. A mason jar with a tight fitting lid. Place the jar in a warm place out of direct sunlight. The top of a fridge, furnace or water heater work well. Shake your jar vigorously at least once a day for 4 weeks. Longer is fine too, but a lunar month should be sufficient. After your maceration is done, find a good spot to work. Filter your tincture into a clean jar or bottle that has a tight-fitting lid or cork. You can do this by pouring it through a paper coffee filter in a funnel. Seal the jar or bottle and let your tincture sediment for a few days. pour or siphon off the clear liquid and bottle it for use. It can keep for a few years. For sore, spongy or inflamed gums, loose teeth, Canker sores, toothache, Gingivitis, Halitosis, sore throat, or Thrush, mix 1 teaspoon of your tincture in a cup of warm water in which you have dissolved 1/4-1/2 teaspoon sea salt. Swoosh some around in your mouth for as long as you can, (spit it out when done), and as often as you can till you find relief. Use it a few more times, then continue using this tincture as a daily preventative. The essential oil can be used in a pinch by dabbing a cotton swab soaked with essential oil on and around the bothersome area. It can also be left between gums and cheek till all the essential oil is dispersed in the mouth. A rudimentary, but still effective tincture can also be made by adding 4-5 drops of essential oil of Myrrh to a teaspoon of an alcohol/water mix like such as vodka. This can be added, as above, to a warm mix of water and salt. The range of healing properties found in the many types of Frankincense is growing daily as we identify and examine each species more closely and study their effects in the laboratory. Whether treating various types of cancer and tumors, rheumatoid arthritis, sore, inflamed joints and muscles, peptic ulcers, ulcerative colitis, Asthma, respiratory complaints, head trauma, depression or anxiety, many active therapeutic compounds are found only in the resin portion of oleoresins not in their essential oils. Along with the unique chemical compounds each Frankincense type claims as its own, they also share many of the same constituents. In my personal opinion, it is safe to say, all types of Frankincense are anti-inflammatory. There is still confusion, despite recent research, or in light of it, as to which constituents are exclusive to each species of Frankincense. This points to the need for more studies around the world of our resin bearing trees. Of the 6 types of Frankincense commercially available to us, only one, Frankincense Frereana, is an oleoresin with little to no water-soluble gum. This means it dissolves almost entirely in alcohol, and there is little benefit to using water in the tincturing solvent. In Boswellia Rivae, Neglecta, Serrata, Carterii/Sacra and Papyrifera, an alcohol/water tincture can capture the water-soluble gum and any phytochemicals it may contain. Though not much research has been done on the gum portion of Frankincense, it too is used in traditional medicine. I would guess that Nature is consistent and produces nothing that has no value. The instructions for making an alcohol tincture of Frankincense are identical to the above instructions for making a tincture of Myrrh. Though I suggest using a 1:5 ratio of oleoresin to solvent by weight instead of a 1;3 ratio as with the tincture of Myrrh. Otherwise, simply substitute the oleoresin of a Frankincense type of your choice for the Myrrh in the recipe. If using alcohol is not an option for you, you will find the oleo extraction of Frankincense and other oleoresins offers a great alternative. are not as well known, and a there is less literature about making and using them. These too can bring us substantially more of the healing compounds found in oleoresins than their essential oils. 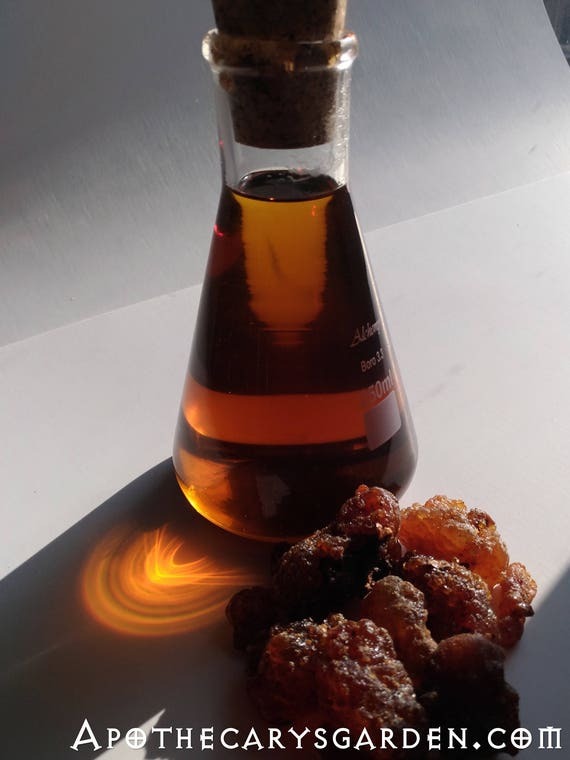 The oleo extract of Frankincense oleo-resin extracted from Boswellia Neglecta. A potent anti-anxiety chest rub with deep calming properties. A vegetable oil such as olive oil will dissolve most, if not all of the healing compounds in many saps. This type of oil infusion can be used as a base for a salve, crème or liniment, making it easy to use externally for respiratory issues, inflammations, muscle/joint pain, aging skin, and many other applications. Considering that many of the active compounds in oleoresins are absorbed through the skin and some are able to pass the blood-brain barrier, these types of products can be especially effective when used externally. Often, creating a medicated product from tree sap is as simple as replacing a unmedicated oil in a salve or creme recipe with your oleo extract. Some take these vegetable oil extracts of oleoresins internally in small quantities. They are not as harsh or concentrated as the essential oils, and do not shock our system as essential oils can when ingested. They are assimilated more easily, and bring us a broader range of healing compounds than the essential oils in proportions that echo their source. That being said,,,let me add a caution. Too much of anything is not good for us. Studies have shown that ingesting an excess of Myrrh oleoresin can cause heart irregularities, and severely tax or cause damage to the kidneys which have a tough time eliminating it. We all have different constitutions, medical histories and tolerance levels. We MUST practice caution when trying new things. Though I believe we need to take responsibility for our own health, I also believe there is likely a talented, qualified, Naturopath, alternative healthcare practitioner, Herbalist, traditional healer, shaman, or progressive doctor in your area, and I advise you to seek them out, and invite them to work with you. If your health is important enough for you to take matters into your own hands, then it is important enough to seek qualified support and expert advice. Spruce, Pine and Fir saps stand at the top of my list as the very best oleoresins for respiratory complaints. I use them in my Great Northern Cough and Chest Balm, and in my St. John’s Wort-Spruce Muscle rub. I have barely changed these recipes in almost 20 years since they work so well. Great Northern Cough & Chest Rub. An all natural alternative to harsh commercial Chest Rubs and inhalers. An oleo extract of Frankincense Neglecta from Ethiopia. Animal fats can work as oleoresin solvents for external applications. Lard and tallow, rendered respectively from Pig and Cattle fat, are traditional carrier/solvents mentioned in many old herbals. Lanolin keeps much better than rendered fats and causes no harm to the animals. Lanolin is much closer in composition to our own natural body oils than other fats, making it an ideal delivery material for nutrients and therapeutic compounds. Win, win, win. My kind of solution. To use animal fats as solvents and carriers for oleoresins, wait till the fats melt in the water bath and use them as indicated for an oil extract. They need to be mixed, filtered and poured while hot, since they will turn more viscous as they cool down to room temperature. Benzoin is a traditional and often used preservative for these types of fat. Adding 1% of Benzoin essential oil is usually recommended. Some saps lend themselves more readily to oleo extraction and others are more difficult. Vegetable and animal fats/oils are not a universal solvent, but offer us a useful and effective alternative in many cases. In general, a fresh and yet pliable sap will part with more of its components, more readily, in vegetable oil or animal fat than a hard and aged sap. An oleo-resin, with little or no water-soluble gum lends itself more easily to a warm dissolution in oil. However, oleo-gum-resins, like most types of Frankincense and Myrrh, require extra attention due to the water-soluble gum component in their makeup. Myrrh, with a 65% water-soluble gum content is likely the most challenging. Finely Grinding these oleo-gum-resins before oil extraction facilitates extraction of both volatile oils and resins, leaving behind mainly water-soluble material, the gum. Recently L. A., a reader of this blog who makes her own oleo extracts of Frankincense to address arthritis in her lower back, described the behavior of water-soluble gums in relation to the oleo-resins most eloquently. Quoting her very loosely, “The polysaccharides are nature’s perfect material to encase and lock in the oleoresins. They create a matrix, a hard shell and barrier that surrounds, isolates and preserves the resins and volatile oils.” This suggests how Frankincense, that may be decades or even hundreds of years old will look the same as a fresh sample, and yield its fragrance to a hot coal. It also points out how difficult it is to know with any certainty, whether we are buying Frankincense that is fresh harvested or decades old. This hard protective sheath of gum is also the reason we encounter resistance proportionate to the amount of water-soluble gum present in a oleoresin when we attempt to make an oil extraction. L.A. also pointed me in the direction of research done in Teheran where an extract made from water-soluble gum of Frankincense Serrata was used in a study and indicated an increase in the learning ability of rats. Other studies based on local traditional medicine have shown an aqueous, (water), extract of Frankincense Serrata taken during pregnancy and lactation strengthened short and long-term memory in infants. See-The Therapeutic Effect of the Aqueous Extract of Boswellia Serrata on the Learning Deficit in Kindled Rats. I want to thank Auntie Doodles, another reader of this blog for sharing the following water based recipe she discovered while visiting Qatar. I assume it is used with either Frankincense Sacra/Carterii, or Frankincense Papyrifera, when one is suffering from the effects of coughs, colds and congestion. 1 heaping teaspoon of loose Frankincense Papyrifera or Carterii/Sacra tears. You can break them up if they are in large lumps, or crush them coarsely in your mortar. Cover with room temperature water. Close loosely with a saucer. Let stand overnight at room temperature. Take the infused water in tablespoon doses as needed for coughs, colds, the discomforts of fevers and flu. It will keep for a couple of days. To keep it longer, pour off the liquid and store it for up to a week, covered in the fridge. To preserve this medicine for months, transfer the liquid to an ice cube tray. When frozen, move the cubes to a sealed container or plastic bag and store for future use. I see numerous visitors from Arabian countries, India and African states coming through this web site. Whether family recipes, or regional traditions, I would be deeply grateful for any information anyone could share about their traditional uses of Frankincense, Myrrh and other oleoresins. Too much of our ancient knowledge is getting lost in the wave of progress we are riding. Ethnobotanical research does not have the economic value or financial incentive of other types of research, and is usually underfunded. It can’t keep up with its role of preserving our rich oral traditions before they are lost. If you would like to share any cultural wisdom or traditional recipes you possess, and help preserve them for posterity, please leave a comment for me below, or email me directly at dnriegler@gmail.com. I offer my thanks and gratitude in advance. Thank you!! Water-Bath or Double Boiler-indispenable tool for working with oleoresins. Most of these tree saps have toning and tightening effects on the skin. Many of them help heal our skin from chaffing, chapping, burns and minor cuts, while some have a long history of use in the field of cosmetics and beauty. The most well-known skin “rejuvenatives” used in beauty cremes are Elemi and Frankincense oleoresins. I have found that Spruce, Pine and Fir oleoresins have similar effects on the skin, adding softness, suppleness and a feeling of youthfulness. Note that these are whole oleoresins. The essential oils in my experience, do not have the same effect. As an experiment, try rubbing a teaspoon of olive oil mixed with a drop or 2 of essential oil on your skin. Leave it on for a short while, wash it off with warm water and dish soap. How does your skin feel? Now do the same with a bit of fresh sap dissolved in olive oil. I find the difference striking and speaks for itself. How to make a rejuvenating skin creme from Frankincense. In my Etsy shop, you will find some of my own medicinal oleo-resin products. Frankincense oleo-resin extracted from Boswellia Neglecta. A potent anti anxiety and stress releiving chest rub. If you would like to create your own oleo extracts or tinctures from these oleoresins, but don’t have access to fresh material, you can find a growing selection of fresh Fairtrade exotic and local oleoresins here in my Etsy shop. If you have any questions, please feel free to leave a comment or contact me via email at dnriegler@gmail.com. Well, back to packing for my big move. Wishing everyone a bright holiday season and a year of inspiration and abundance in 2015. Hi.. May I know do we swallow or throw away the remaining of the white resin clumps which came from the Frankincense Water after soaking overnight? Is the clumps digestible in our intestine? Hi. I think that is a choice you can make. Some people dispose of the spent resin after infusing it in water a few times and others consume it or use it as incense. As far as digesting Frankincense and benefiting from the resin compounds that don’t dissolve in the water, there are studies that indicate the Boswellic acids and other resin compounds are better absorbed by the body when taken with fatty foods. This makes sense since the resin is not water soluble, but oil soluble. Thank you for such an excellent resource on Frankincese and other interesting topics. I am contacting you because i am about to start taking frankincese (B. papyrifera) as a resin. I have taken frankincese as a pill in the past with good results (reduced inflammation- i am presently in a more inflammatory state), but decided that working with the plant in its whole form would be more rewarding. I will probably want to be able to take it frequently throughout the day. Do you think the tea method described on this blog, where you dissolve the resin in room temp water over night, would be the best method for me? In the above post it makes it seem as though this method is best for sore throat, where I want the support systemically. Though taking the tea is a traditional Arabian method and home remedy, it only delivers a small portion of the therapeutic compounds found in the whole oleoresin of Frankincense. Specifically, water will only dissolve the water-soluble gum and will leave most of the resin and essential oils behind. I believe the best way to ingest Frankincense and benefit from the whole range of available therapeutic compounds, is to consume the whole, powdered oleoresin. 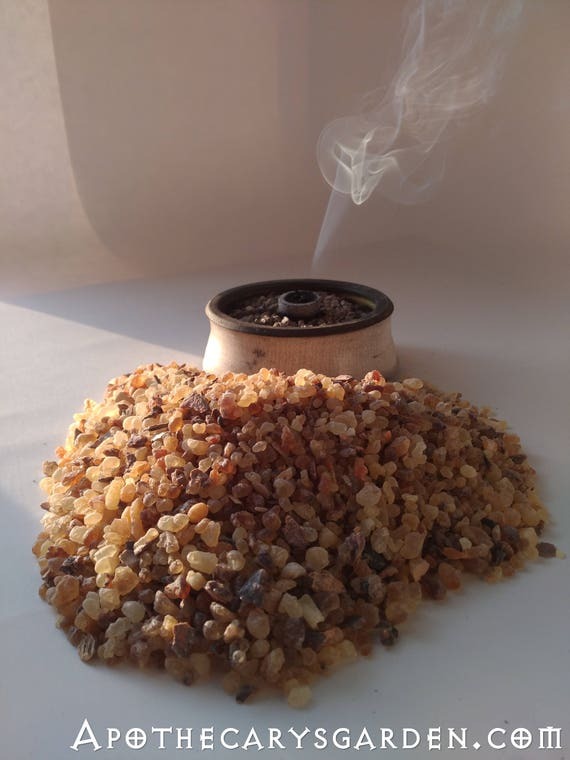 My practice is to powder the Frankincense as per these instructions-https://apothecarysgarden.com/2013/03/22/how-to-grind-frankincense-myrrh-and-other-oleo-resins/ , and take 1/2 to 1 level teaspoon of the powder 3-5 times a day, chased with water. You could encapsulate the powder in gel caps if you found the taste unpleasing, though I personally enjoy it. As with all new routines and materials, start small and see how your body responds to the “medicine”. Adjust the quantities that work for you accordingly. Please let me know if you have any other questions I can help with. As I’m preparing to make a frankincense and myrrh cream I started to wonder how well pine oleo resin would work if added to the cream. Do you know if pine resin (I can’t remember the exact pine tree I got it from) is complementary (either synergistic or chemically) to frankincense & myrrh? I am hoping to use it more as a skin healing cream for myself. Thanks so much in advance for answering my question and for all of the knowledge you share on your website. I’ve learned a great deal. Hi Shaie. Pine oleoresin will blend easily with your oil base with which you can make a creme.So chemically it would work with the others. The easiest way to see if it is complimentary energetically or otherwise, is to make a small batch without it. Test it and get to know it, then make a second batch with it. Astrologically the Pine and the Frankincense have an affinity-Mars/Pine and the Sun/Frankincense, Moon ruled Myrrh has a special polar relationship with Frankincense and they tend to support and compliment each other.There is a classic and time-honoured synergy between them. Pine doesn’t fit in as smoothly to this tight relationship between Sun and Moon. But, there is no better way to learn than by doing. I would try it and see how your product feels, (energetically and otherwise), how it smells and performs with the addition of Pine resin. 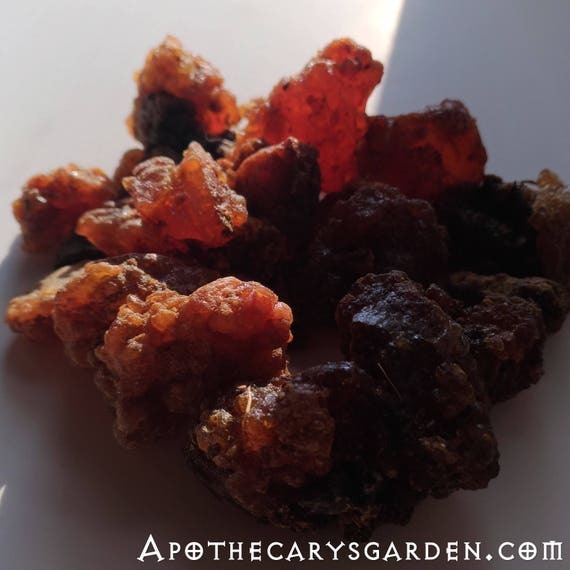 Wondering if you can answer a question for me… I recently got some Labdanum resin and want to make it workable for making some beard wax and for perfumery. Would you recommend making a pitch out of it by simply heating (in a double boiler) with an equal amount of oil or should I tincture it and the evaporate the alcohol? For an oil based mustache or beard product I would do the double boiler and dissolve the Labdanum in the oil. For a perfume I would use alcohol and you may be able to do it at room temperature. You could make an absolute as you describe, by evaporating the alcohol from your tincture, and in theory it would dissolve in oil and could also be used in alcohol based perfumery, but I haven’t tried it myself. I have noticed some oleo resins will impart less of themselves to an oil after making an absolute and seem happier to transfer directly to warm oil. If you do experiment with transferring an absolute of Labdanum to an oil I would be happy to hear how it worked for you. Keep in mind, you will always have a bit of undissolved residue when you use raw Labdanum no matter which solvent you use. Dan, another stellar piece on resins and oleoresins. I (make myself) wait until I have all my work done before I sit down to read your posts because it is always so rich in herbal information and requires my undivided attention. Thanks for keeping the herbalist tradition alive and vibrant. P.S. I use frankincense essential oil in my handmade toothpaste but I think it would be a good idea to incorporate the oleoresin for the holistic benefits. Using the whole oleoresin is a great idea! I think the water soluble gum has “frothing” power which might be cool too. I’ve always wanted to make a Frankincense toothpaste. I might hit you up for your recipe. If I ever finish packing that is……. You can hit me up any time for the recipe and it looks like I need to hit you up for some neglecta and some tears to make an oleoresin for my toothpaste.